Every once and a while I’ll come upon an antiquarian painting, print, fresco, sculpture or other art piece that peaks my interest. This is one of them. 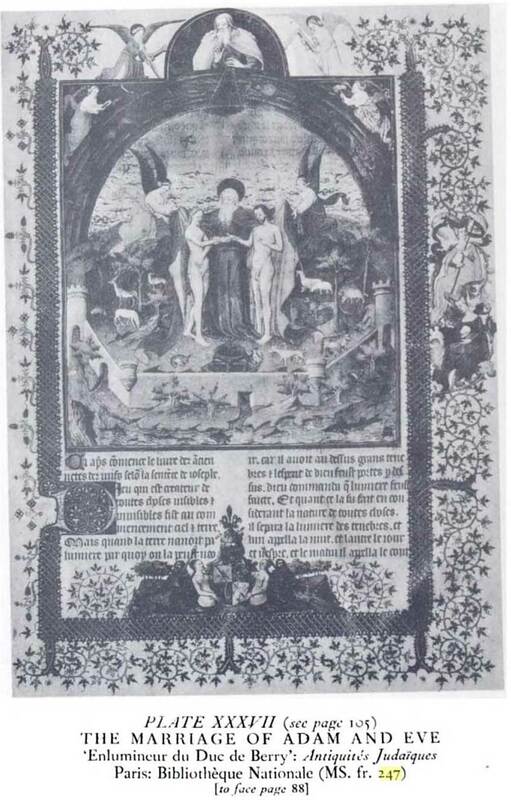 This is an illustration by Jean Fouquet from a french translation manuscript of Josephus‘ Jewish Antiquities. 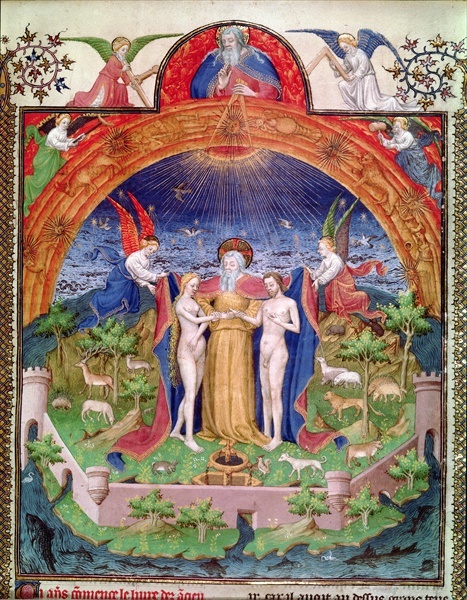 It is entitled, “The Creation, God Introducing Adam and Eve,” and dates to 1470-76 C.E. Currently it is maintained at the Bibliothèque Nationale in Paris, France. 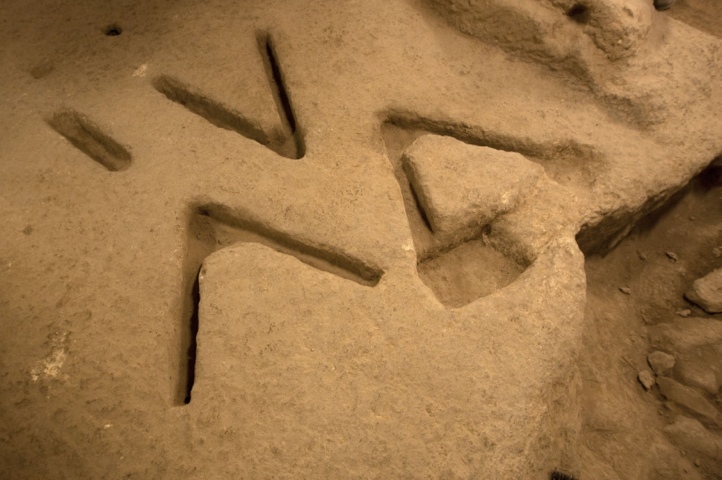 God is portrayed in the center, joining the right hands of Adam and Eve in a sacred handclasp, likely the dextrarum iunctio, a symbol of the eternal marriage of the two. Angels on both sides of the group seem to clothe Adam and Eve in the sacred garments worn by God. The Garden of Eden is symbolized as a walled city/fortress, with the rivers beginning at a fountain and exiting through the walls. 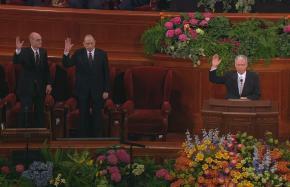 Is God represented here twice, or are there 2 Gods? God is depicted as a man, in both cases. You can see a similar representation in a 16th century sculpture called The Garden of Eden or Love. Anything else interesting that you see in this illustration? Does anyone know anything else about this particular work, or similar ones? Update (4/20/09): I found another very similar illumination from the same time period. 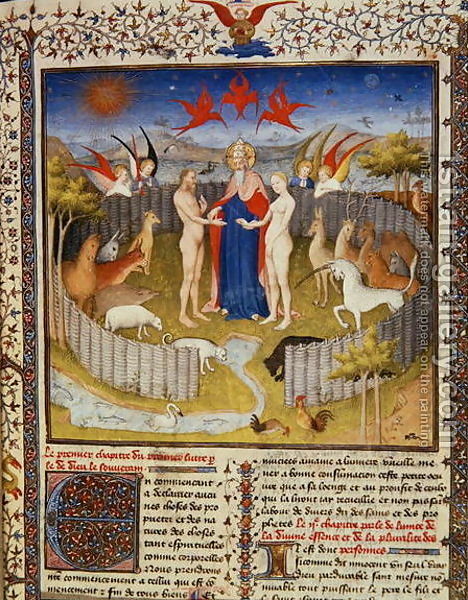 This one is entitled “The Marriage of Adam and Eve” from “Des Proprietes De Chozes” by Jean Corbechon around 1415 C.E. You can see very similar symbolism here. The marriage of Adam and Eve, from 'Des Proprietes De Chozes' by Jean Corbechon, c.1415. Update (4/20/09): Here is a detail of an engraving by Jean Duvet cerca 1540-1555 which depicts the same – “The Marriage of Adam and Eve.” You can see the full engraving here. 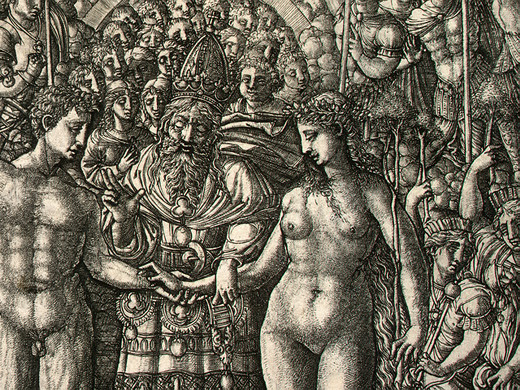 Detail from engraving "The Marriage of Adam and Eve" by Jean Duvet, cerca 1540-1555. 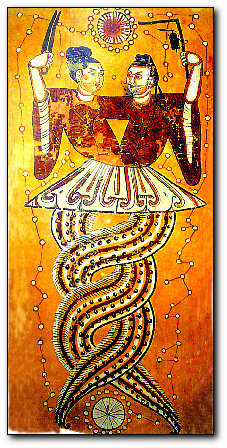 An ancient painting of Nüwa and Fuxi unearthed in Xinjiang, holding the tools of creation - compass and square.